Public bathroom etiquette is simple: keep to yourself, don't start any intrusive conversations with strangers, and try your damnedest not to spill any soft drinks. One man learned that violating these simple tenets can cause a minor crisis, however, especially when broadcasting any urinary faux pas on the internet. 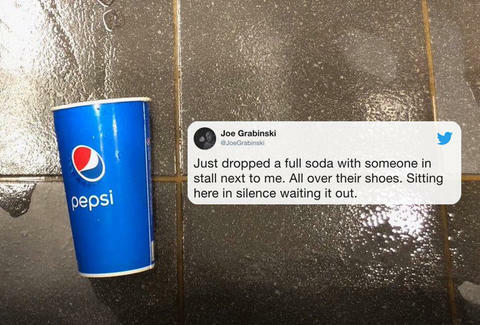 On Thursday, Joe Grabinski was doing what anyone with enough fiber in their diet does once or twice a day: using the restroom while drinking a soda. But, in a calamitous turn of events, Grabinkski dropped his giant cup, and the contents splattered all over the floor. The sugary brown liquid, likely a cola of some sort, even splashed onto the shoes of whoever was occupying the stall next to him -- an unwelcome present that would stain anyone's Pumas. Naturally, Grabinksi tweeted the saga for the world to see and offer its collective two cents. Soon the splatter and Grabinksi's trepidation were noticed by people on Twitter. The mentions came flooding in with criticism and advice. Why are you taking your drink into the shitter? Hope that they didn't see the cup and just thought that there was a massive explosion of fluids you should see a doctor for. I did that once with a thing of ketchup at Shake Shack. Victim was wearing sandals so spent the day with Heinz toe-jam. I swear I'd be silently cussing you out with every squeak of my sneakers. Similar situation on a bus in NYC. Dropped my entire iced coffee and every time we stopped, the huge puddle would rush to peoples feet/belongings. I acted as shocked and angry as everyone else...still makes me sick to my stomach to think about it.🙈#selfpreservation? Grabinksi tweeted the play-by-play, updating everyone following the thread of his fear, embarrassment, and describing life in his new home, the bathroom stall. I wish my story developed beyond me hiding like a coward for 30 minutes. I waited 30 minutes until the coast was entirely clear. Now I just need to change my shoes. The only way they can pin this on me. I can’t change the past. I can only learn from my mistakes and move on. Of course, this could all just be a craven attempt at grabbing some quick viral fame, but we're inclined to believe otherwise. Let's hope Joe made his way out of the stall.